Justisaur posted an absolutely brilliant method of ability score generation to rec.games.frp.dnd. It’s simple, it provides some nicely organic scores, and it seems, as best I can tell, more fair than other random methods. I’ve seen it called a few things, perhaps the simplest name is ’27-25-23′, after the three key numbers. Roll 4d6, select the three highest. This is the first score. Subtract the first score from 27. This is the second score. Roll 4d6, select the three highest. This is the third score. Subtract the third score from 25. This is the fourth score. Roll 4d6, select the three highest. This is the fifth score. Subtract the fifth score from 23. This is the sixth score. Arrange the scores to taste, add a +2 to a single score of your choice. 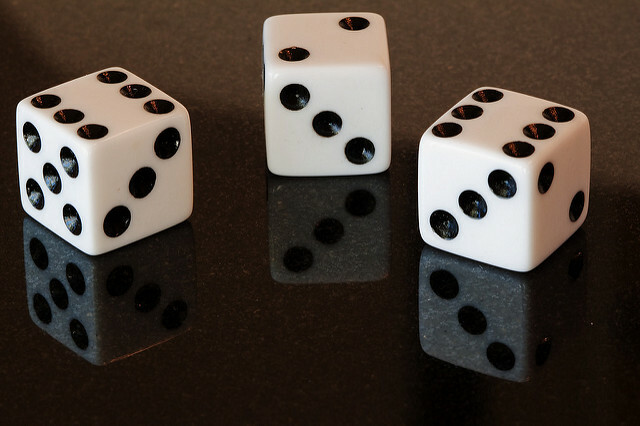 Any time a value outside 3..18 would come up (a low rolled value), simply reroll the dice. This shouldn’t come up too often, though (about 10% of the first roll, less than 3% of the second roll, less than 0.5% of the third roll). Everyone who uses this method ends up with an ability score total of 77. The mean roll is 12.5, the lowest possible rolled score is 5 (which means a score of 18 — 23 base, minus 18), and even that is avoidable if you put your +2 adjustment on it. I did some statistical analysis of it (counted the possibilities). I found that with this system there is about a 50% chance of ending up with at least one 18 (if you want one), and a 33% chance of at least one 17 (again, if you want one). There is a better than 80% chance you’ll end up with at least one score of 17 or 18 (if you want). So, simple to apply, good mean value, nicely organic values (no 18, 18, 12, 10, 8, 8, as is often seen with point buy, nor the ‘boring’ elite array), and absolutely fair (everyone has the same ability score total, avoiding big discrepancies that can happen with purely random values. Point buy works much the same way, except that you pick the three ‘random’ values rather than roll them. I’d remove the +2 adjustment at the end, though, because of the greater control available. You can easily avoid all penalties if you want (at the cost of no 18 score), you can easily have multiple high scores (if you’re willing to take the penalties), and so on. I also did an analysis using 3d6 and found that it gives a slightly better chance of ending up with at least one 17 or 18. I didn’t have time to include it here, and have not found time to do it over… but it’s how I use 27-25-23 today. I didn’t want to invalidate the analysis above so I have not changed the article beyond adding this note. Thanks for looking into this (I’ve left a few comments on your page). It’s been a fair while since I’ve studied statistical methods, so it’s nice to see they back up what I’ve found in practice — that this works very well. Here is an automated roller for this method. Pingback: Reducing the Impact of Ability Scores | Keith Davies — In My Campaign - Keith's thoughts on RPG design and play. The problem however is that, in most systems, an 18 paired with a 9 is more powerful than a 14 and a 13. You may not have noticed, I commented on that article back in July. Yes, 18+9 is often better than 14+13. I’m fine with that. The process described here is simple, easy to apply, and does not depend on the use of a lookup table. That alone makes it more valuable in my eyes than the method described in your linked article.